All JGI portal sites offer an area for downloading primary sequence, annotation, and other data. For older genome assemblies, data is provided through individual download pages which simply list available data files with direct links to download each file. In these cases, please follow any special instructions given on the page. For newer genomes, and for all Genome Groups, many new file types are now supported: All RAW, Assemblies, Quality Control, various analysis files. All files are accessible in a variety of ways each designed with a particular class of user in mind. We are setup to allow easy downloads of individual projects/genomes and don't provide means to download whole collections of data. For your convenience and fast downloads you can use Globus and API. Our raw reads are also published to SRA at NCBI for bulk download needs. There is the web driven approach where the user finds a portal of interest and clicks on the Download tab of that portal. Downloads are available in a tree structure that divides the files into logical groups so that the user can download RAW files, assemblies, and so on with a single operation. To download multiple files at once, select the checkboxes to the left of file sections or individual files, and hit the Download button. The selected items will be packaged into a .zip archive file and down-loaded to your browser. Note that you can select or deselect all download files by toggling the checkbox at the root of the tree. 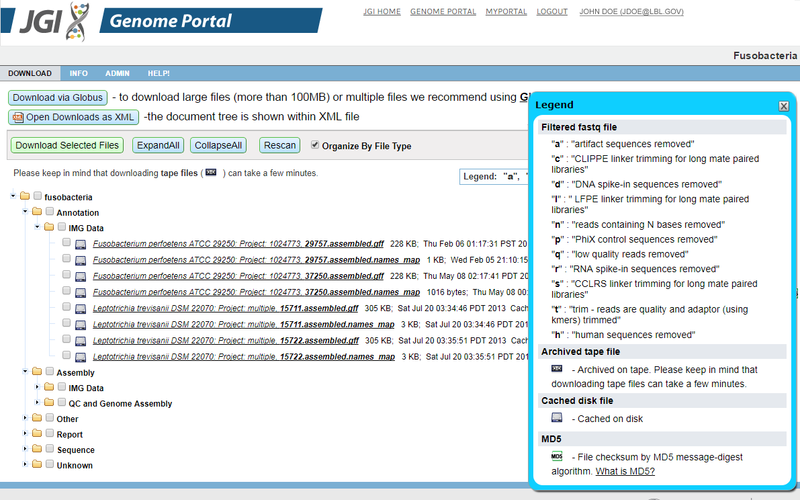 To download an individual file, click on the desired single item in the tree. Check the box "Organize By File Type". To download a large number of files you can use the Globus service. Create an account. Follow the instructions in email from Globus to activate your account. The dialog box will appear where you have to provide your Globus Account name. Submit the request and wait for the email from our service when your files are staged and ready for download. Click on the link in the received email. 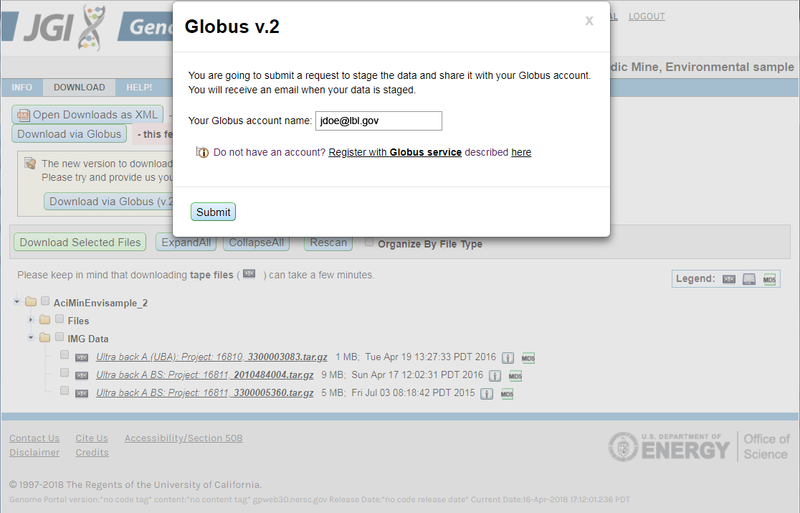 Globus then provides a user friendly interface for big data transfers. Provide your second endpoint you are planning to transfer to. Authenticate to your second endpoint. Select files and start to transfer. Behind the scenes the transfers are performed using GridFTP which is a parallel transfer protocol and program. GridFTP has built in checks that ensures the integrity of the transfers and guarantees that the files reach their destination intact. A third way to retrieve data from the JGI is available for users who need to download using scripting or programming. You can find that using our JGI Portal search on the home page. Use any search terms necessary to find the portal you want, click on the "Download" link in the "Resources" column, then make a note of the short portal name in the URL. It is located between the second and third "/" characters in the path after the web host. For example, in the URL https://genome.jgi.doe.gov/portal/Aurpu_var_sub1/... the portal name to use for API download is "Aurpu_var_sub1"
You can also export the full search results into CSV format by clicking "Project Overview Report", then you could iterate over all your projects.The short portal name is identified in "Portal ID" column. Log in using the following command. 3. Download a list of files available for the portal that you are interested in. 4. Find the file that you would like to download in the XML document and download it. The details of XML schema (XSD) can be found here. 3. Request the data to be staged for download via Globus. Replace UUUUU@DDDDD.NNN with your Globus user name. 4. Check the status of your request. After that, you can either enter the URL in your Web browser or use the values of the "origin_id" and "origin_path" parameters of the URL with Globus API calls. For both new and old download pages, you are required to read and approve a JGI Data Usage Policy statement before accessing JGI data. This statement will appear on the first page you see when enter the download area, and may vary by organism. To continue to the download page, click the "Agree" button after reviewing the policy. You may also select the checkbox next to the "Agree" button to bypass the usage statement the next time you visit the download area for the given organism or group. If you would like to review the policy again please use "Show Data Usage Policy" button under the main navigation.